In addition to the WKD ... World Kigo Database, here we collect non-seasonal words (topics, cultural keywords) used in haiku which carry a lot of regional and cultural information. 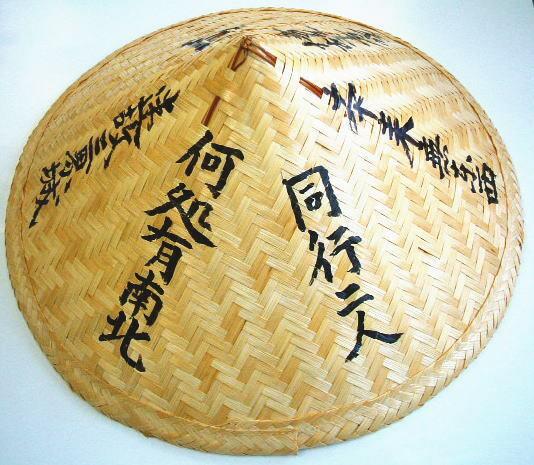 the English "straw hat" in Japanese is a "wara booshi " or even "mugiwara booshi". Let us examine some kigo and words with our headgear. Read more about the translation of this word here.
. Legends about Sugegasa . 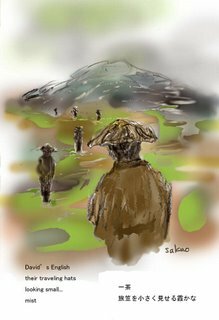 Pilgrimages have been very popuar during the Edo period, as a means to travel freely and get out of the town. 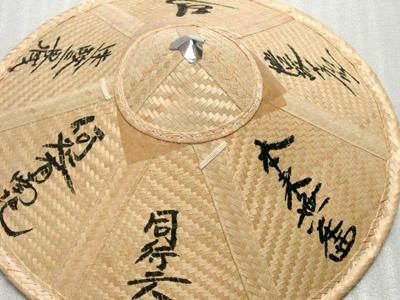 There are various types of straw hats for the pilgrims, these words are all kigo for spring. The hat was also a protection against rain. This hat is rather large and protects the walking pilgrim from rain. 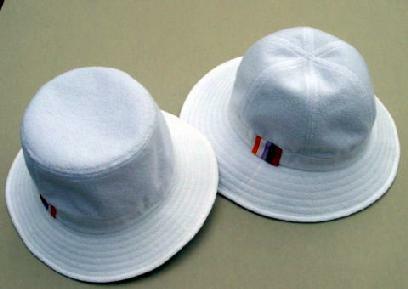 In our modern times it comes with a plastic cover to protect the hat from the rain ! 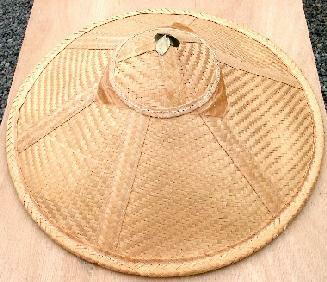 This type is also traditionally imregnatged with the sap of the persimmon tree (kakishibu) to make it rainproof. It becomes a dark orange/brown color. 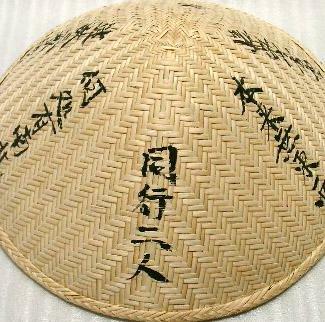 These hats are usually without inscription. Any of the above types without inscription can also be used. 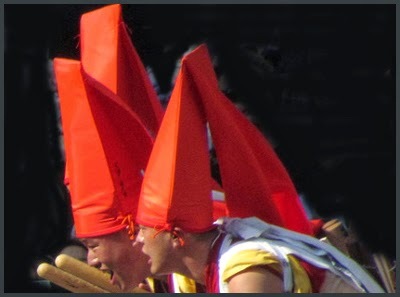 7 atop each other in two columns with sedgehats. Height is 3-3/4" at the tallest point. 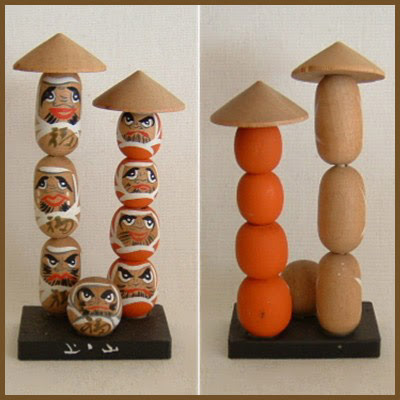 The first row has three elongated Daruma with the natural wood finish. 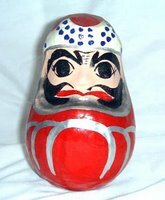 The 2nd has red Daruma. Each one has a different expression on his face including one crying. The top two natural and the top red dolls are nodder style. 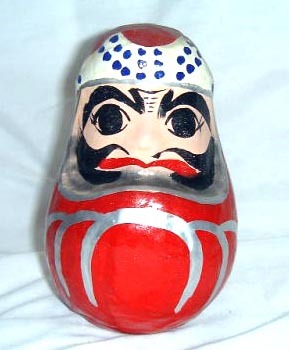 Daruma with an umbrella (kasa　傘 ). Japanese ladies try to protect their faces from the summer sunshine, to stay as white as possible. The straw hat comes in a form rather like a cowboy hat. Cheap versions come from China these days and cost only about one dollar. 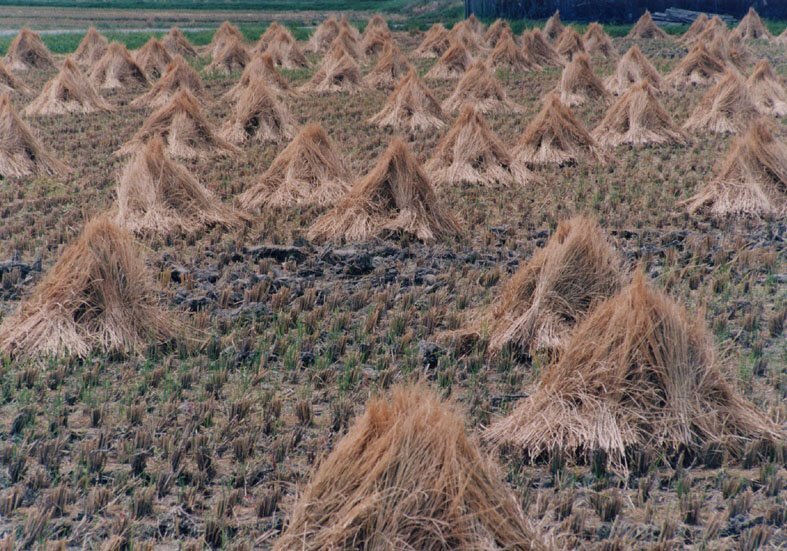 "straw hat", warabooshi 藁帽子 , is also the name for the harvested rice heaped up in the fields to dry for a few days. It was word by ninja and the firebrigade, to protect their head. 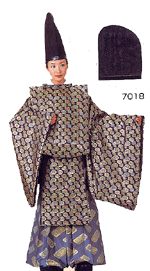 Here is one from the famous Hattori Hanzoo 服部半蔵.
. zukin 頭巾 (ずきん) hood . A playful, pun-filled poem. 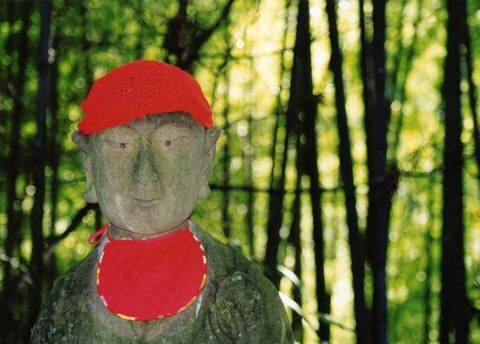 Basho is without rice or a winter hood and converts his empty rice sack into a hood. 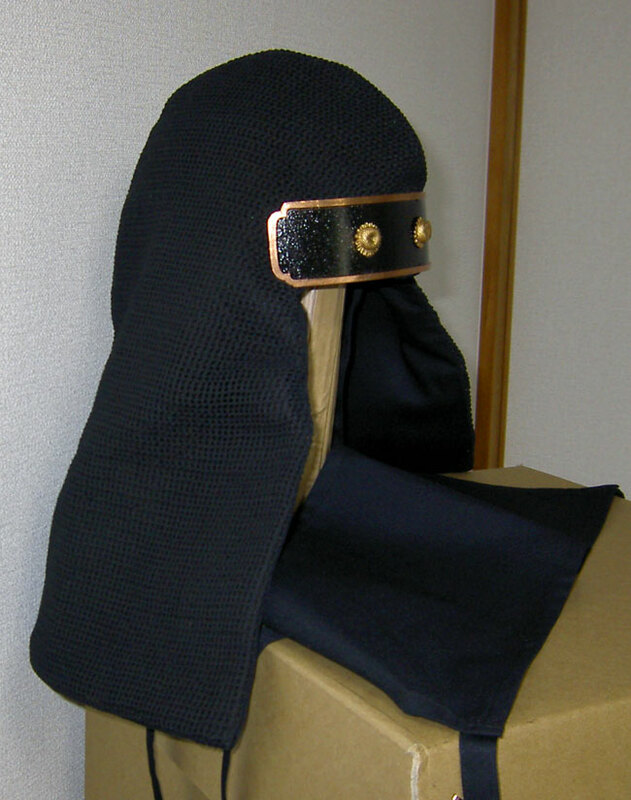 Nagezukin, one of several types of head-pieces used to keep out winter’s wind and cold, had a long section draping down the back. 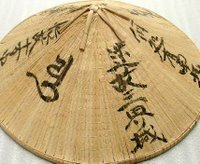 Dai was a type of hood, and also the word for “topic” for a poem. 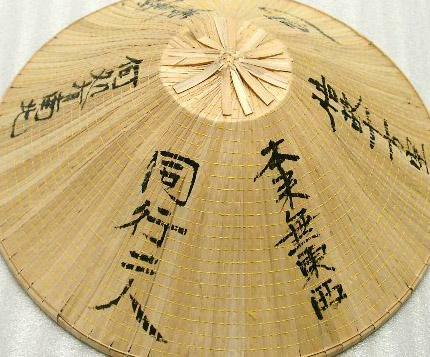 Written on the 17th day of the 12th lunar month, 1688 元禄元年12月17日, Basho age 45. Hokku for a kukai meeting with the Fukagawa happin 深川八貧 "Eight Beggars of Fukagawa". 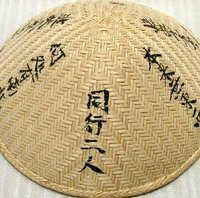 nagezukin 投げ頭巾 "throw cap", is a cloth cap or hood or squared-off bonnet with a long piece of cloth to "throw" down the back. 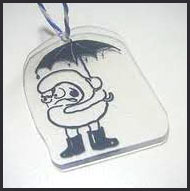 yuki is a pun with the pronounciation for snow or going 行き, in the Danrin style of hokku. 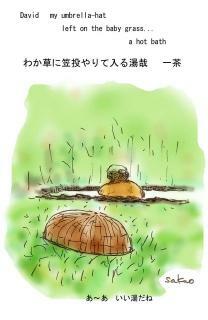 Fukagawa happin 深川八貧 "The Eight Poor of Fukagawa"
. 芭蕉庵 Basho-An in Fukagawa　深川 . 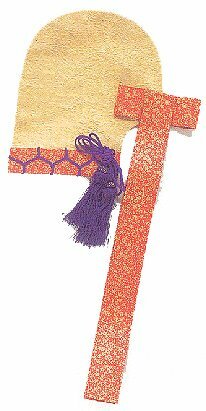 The Shogun and other noble folk would wear a purple headband when they were ill. Even today, we can see this in Kabuki plays. Here is Ichikawa Ebizo as Sukeroku　助六.
. Hats and caps with Daruma pattern . This is the haiku that started this whole discussion. Henderson, "An Introduction to Haiku"
Click HERE to read more about SNOW on my HAT"
This hokku is from the New Year's anthology of the Katsushika school of haikai in Edo published at the beginning of 1796, so it must have been written in 1795, when Issa, 33, was traveling around in western Honshu and Shikoku. 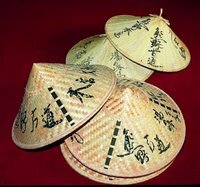 The wide, woven-rush hats belong to travelers (or a traveler) off in the mist, either coming toward Issa or disappearing into the mist. The large hats are the most prominent parts of the travelers, who must be on the verge of slipping into or out of sight. Their hats, still partly visible, link the barely seen travelers to both the visible and invisible worlds. Japanese depictions of ghosts show them with no feet, and the feet of the travelers in this hokku must be invisible or nearly invisible, though they are not exactly ghosts. They are close enough to be individuals, but far enough away to be beyond the I-you relationship. Are they linked to Issa in his memory, or are they about to burst into his world? In the waka a high-ranking warrior, perhaps implied to be Sanetomo's father, the first Kamakura shogun Yoritomo, is hunting in some wild fields covered by low bamboo. Resting for a moment, the warrior sits on his horse with his bow in his right hand. With his left hand he reaches back and makes sure the arrows in his quiver are arranged correctly so they can be pulled out easily. On his left arm is a long gauntlet, a thick sleeve with mail and pieces of metal on the outside that covers the lower 2/3 of his arm as well as the back of his left hand, leaving only the tips of his fingers and his palm uncovered. This strong gauntlet protects his left arm from being hit by the bowstring, and in battle it would protect his left arm from an enemy. On the day of the hunt the hail bouncing off the gauntlet creates an image of strength and vitality, as if the warrior were ignoring the hail and gathering his energy as he prepares to ride off. This is important information on many thinks about hat. thank you so much your helping me in haiku working. Literally, the hat was left at the last "dwelling" (yado). I take this to mean an inn. The air was so wonderfully cool, Issa went out bareheaded, leaving his kasa behind. so let us look at the cherry blossoms ! In March of 1688. Basho with his student Tokoku 杜国. 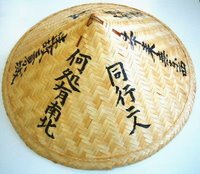 a maruzukin 丸頭巾 was used by elderly men. A beautiful female devil named Tateeboshi 立烏帽子 Tate Eboshi was the wife of 鬼神 the Demon King 大竹丸 Odakemaru. 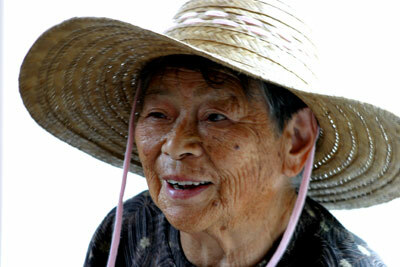 And more legends about this Lady Tate-Eboshi.